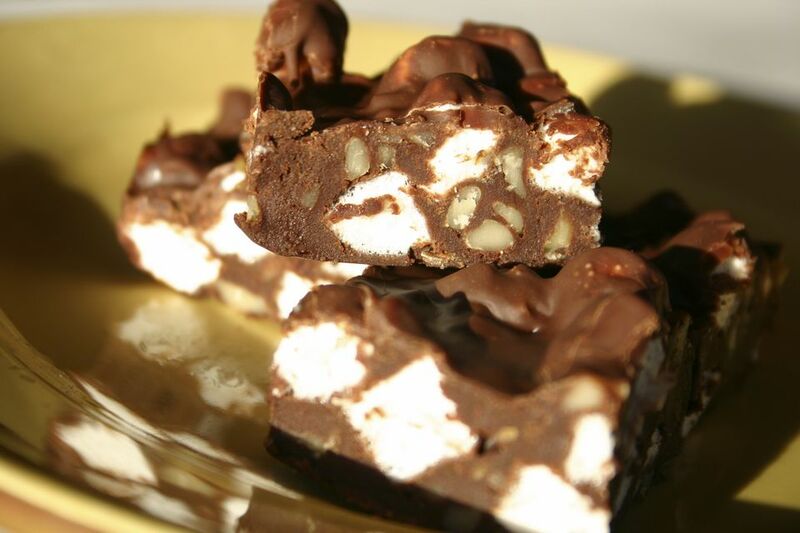 This rocky road fudge recipe is cooked on the stovetop the old-fashioned way, with sugar, milk, and chocolate. The miniature marshmallows are chilled to prevent melting, and the chopped pecans or walnuts are optional. It's a delicious and very special fudge, perfect for holiday giving. Add dried cranberries or chopped candied cherries to the fudge for a more festive look. See the tips and variations for more ideas. Line a 9x5x3-inch loaf pan with foil, extending foil over pan side edges. Butter the foil; sprinkle marshmallows over the bottom of the pan then put in the freezer while making fudge. Lightly butter the interior of a 2-quart saucepan; add sugar, milk, chocolate, and corn syrup. Cook over medium-high heat until the mixture begins to boil. Continue boiling gently, stirring frequently, until the mixture reaches the soft ball stage (see below) or registers about 234° to 238°. Remove saucepan from heat; add butter and vanilla without stirring. Let cool for about 30 minutes, then beat with a wooden spoon until the fudge just begins to thicken. Add chopped nuts and beat for a few more minutes, until it begins to lose its gloss but is still pourable. Pour over marshmallows; score into squares when set but still warm. When fudge is firm, remove from pan using foil to lift it. Cut into squares and store tightly covered. Makes about 1 1/2 pounds. The best and most reliable way to test is with a candy thermometer, but if you don't have one, use this method. In about 1 cup of cold water, spoon about 1/2 teaspoon of the hot candy. Put your fingers into the water and push the candy together to form a ball. Gently pick the formed ball up — if the candy separates and will not form a ball, it is not done — from the water. The ball should flatten slightly. Repeat the test, using fresh cold water each time, until your candy tests done. Add chopped raisins or cranberries or chopped dried cherries. Instead of pecans or walnuts, add chopped peanuts to the fudge.